Learning how to use shaving soap is probably one of the trickiest things to learn about wet shaving with a safety razor, oddly enough. The first couple weeks I tried it, I was just terrible – I didn’t know how much to lather up, when I was actually done, the right way to spread it on my face, or anything. The whole thing ended up just being a huge mess, with shaving cream haphazardly placed on my face in weird lumps, and it ended up hurting quite a bit and made me seriously consider going back to an electric shaver and beard trimmer. Fortunately, over the years I’ve gotten the whole rotten method down (I think), and I believe that I’ve got the right set of advice for any aspiring wet shaver to get the method down on their first try. Whether or not you’re just starting out, or if you just feel you need some pointers, keep reading! Every good wet shaver knows that you can’t paint a masterpiece without the right tools. Getting the right brush, soap and mug are everything when it comes to getting the right lather. 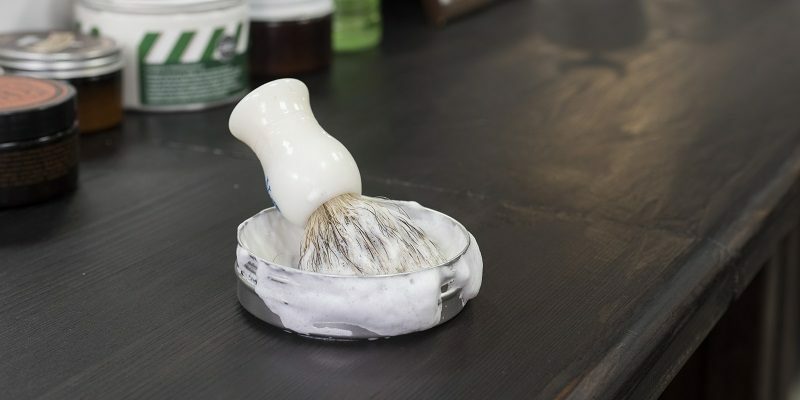 When it comes to the shaving brush and scuttle, I’d recommend getting a nice, simple shaving brush with badger hair – that’s the softest kind of brush you can get, really, and it retains water very well. Also, be sure to get a shaving mug you’re comfortable with – I prefer the kind with the little ball grip on the end, since it’s just neat, and it gives you greater stability when you’re actually forming the lather. As for the soap itself, I highly recommend trying some samples if possible to see what works for you. Not ever soap is going to work for everybody, and everyone’s got a different idea of how much fragrance they like, the texture, and so on. I’d say the most important thing is to get something that suits you; also, try to steer yourself toward natural ingredients whenever possible, as they are just much healthier, simpler and more affordable than the artificial stuff that just might mess up your face and dry it out. The best shaving soaps have all natural ingredients and essential oils that serve to properly nourish your face; that way, you get no redness or irritation. Once you’ve got the right equipment picked, it’s time to start really learning how to use shaving soap. First off, though, you’re going to want to soak your shaving brush. First, plug your sink up and run hot water into the sink until you can put your shaving brush all the way in it. Once you do that, leave it in the sink for a minute or more to let the fibers soak up all that water. That will make it a lot more receptive to the shaving soap you have, and will help the lather build up all the more. When you pull the shaving brush out of the water, don’t shake too much of the water out – you’ll want to make sure there’s enough there to soften up your hairs and open the pores up. This is absolutely vital to achieving a nice, healthy shave, so don’t skimp on this part. Once your brush is soaked, it’s time to actually use the shaving soap! Put your soap in your shaving mug. Put the brush in and move it around in circles quickly; the rounded interior of the mug will work with the brush to start pummeling the soap into a rich lather. When you first start doing it, you’ll see a lot of larger bubbles, but keep going – as you keep swirling the brush, the soap starts to form more and more smaller bubbles, and eventually you won’t see bubbles at all. The whole process takes about 30 seconds at maximum, and by the end of it you’ve got a rich, luxurious lather that will work great on your stubborn stubble. Now that the lather’s built up, it’s time to actually get it on you. Get your brush nice and soaped up with the lather, and use that same circular motion to rub the soap all over your face. In many ways, you’re increasing the density of the lather here too, making it another stage of the lather process. There you go; that’s how to use shaving soap in four easy steps. It’s not rocket science; we basically told you to just put the soap in, swirl it around until it gets fancy, and put it on your face. Still, there are many things that can go wrong in a shaving soap application process, so we felt good giving you a step-by-step look into how it should be done. After all, wet shaving is practically an art, and you can’t master the discipline if you don’t know the fundamentals. Now go out there, pick a nice shaving soap, and get that face clean!